We are Edenflo Pump Truck Services; we offer hydro excavation, hydro flushing, video line inspection (CCTV) and vacuum truck services to commercial and residential customers throughout the British Columbia Lower Mainland. We operate a fleet of tandem axle vacuum trucks, including “low profile” vacuum trucks we call "Lowboys", complete with high pressure jetting systems. Our "Lowboys" give us the ability to access areas such as underground parkades, narrow laneways and elevator pits; previously inaccessible with the larger trucks. Our Combination Vacuum/Flusher Trucks give us hydro-excavation and high pressure flushing capabilities. Our Closed Circuit Television Video (CCTV) pipe inspection unit gives us the ability to run cameras through sewer and drainage lines, performing detailed inspections to identify deficiencies in the sewer system as well as providing a means to evaluate the effectiveness of various maintenance procedures. 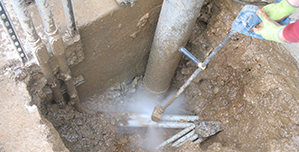 Prompt repair of damaged and defective lines results in a reduction in the number of trouble spots, infiltration and inflow, and general deterioration. We are a service oriented company with a goal to provide same day or immediate service. Our professional, experienced and knowledgeable technicians will work hard to ensure our customer’s satisfaction. If you have any questions about our services and specific fees, please feel free to contact us. We believe that, given the opportunity, we can save you headaches and money! "We are so happy with the service we got from Edenflo! 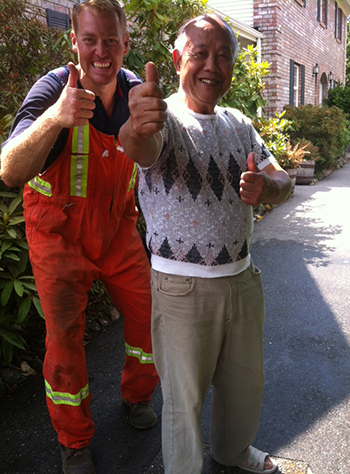 First we needed our septic tank pumped and then I called them back when we needed to clean our drainage system. Right from the first phone call to when the guys drove off, their service is professional, friendly and affordable. Not knowing much about plumbing, septic, and drainage systems, I asked a lot of questions, watched what they were doing and learned a lot about how it all works and what we can do to keep things working well. It was so nice of John to explain everything! Totally recommend their service to others!" - Julianne Layne via Google+. Contact us for any questions or inquiries about our superior service.